It's been a couple of weeks since our last post and we've had a little adventure.....some fun....some not so fun. Nothing serious mind you....just one of life's little nudges. A couple of weeks ago we were given an additional task to perform while we were out and about our normal Road Monitoring jobs....graffiti removal. 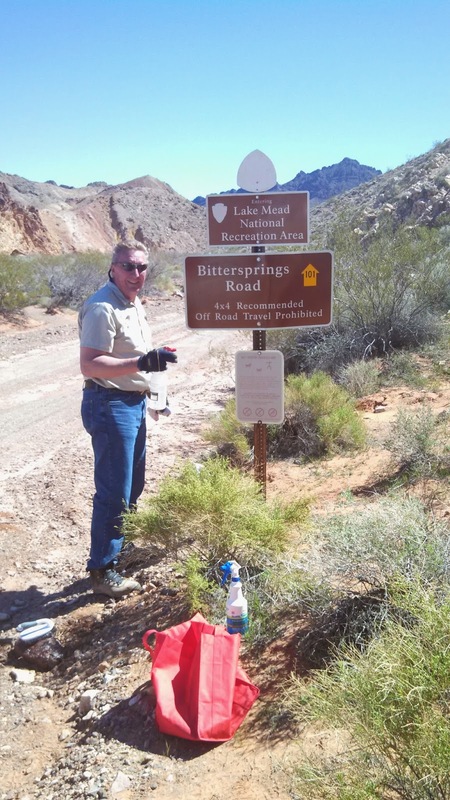 It seems as though someone just happened to carry a can of brown spray paint in their 4-wheel drive while they were exploring some of the back country roads in Lake Mead. This is the result. Our supplies on this day included some scrub brushes, water and environmentally friendly paint remover. After a good soaking, scrubbing and rinsing, the signs were almost as good as new. Just remember...we are trained professionals so don't try this at home! I may have mentioned that I started playing softball on a Sunday Night Over 40 league. After a couple of weeks of playing I was introduced to some guys who manage a couple of 60's tournament teams. I was invited to 'stop by and try out' one Saturday morning, which I did....and what do you know....I was asked if I'd like to play in a Senior Softball Spring National tournament. After many micro-seconds of consideration I said YES! So last week Joan and I loaded up the RV and headed to St. George, Utah for the weekend. We decided to go early and spend some time in Zion NP before the tournament started. We traveled on Wednesday and set up at Sand Hollow State Park. Early Thursday morning we left Sand Hollow taking a back road to Hurricane and Zion. We rounded a corner and were surprised by what we saw.......icicles. It was only 46 degrees by our car thermometer, but it must have gotten much colder during the night for this to have happened. We drove into Zion and went in search of a nice hiking spot only to find every trail head parking spot taken and dozens of cars parked along the roadway at almost every pull off. Oh yeah...it's spring break. Not interested in hiking in a conga line we regrouped and returned to one of our favorite drives near Zion, Kolob Terrace Rd just outside of Virgin. Much less traffic and the scenery is just as pretty. We pulled off at a lookout and had a picnic lunch before taking a short 3 mile hike.....beautiful scenery and beautiful company. Friday morning we headed to the Canyons Softball Complex in St George, a short 20 minute drive from our campground. Our team, LVSSA Raiders went 2-0 in the seeding games of our AAA 12-team bracket and finished #1 Seed. Good start. Unfortunately Saturday didn't follow suit and we went 0-3. Oh well, still had lots of fun, got to meet some new softball buddies and I even managed to hit my 1st dinger of the year...a 3-run shot to center field. Man did that feel good! 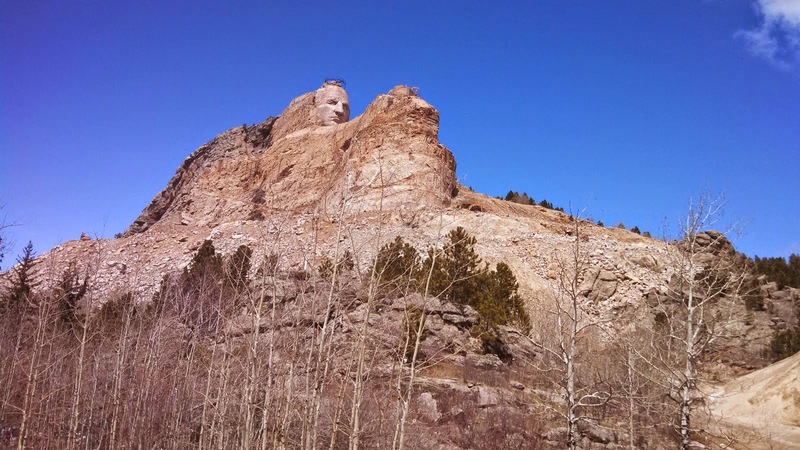 And I've been invited back to play with them in the fall when we return from Crazy Horse. What a deal. Spring is definitely here in Lake Mead and everything is blooming. This week is Joan's last work week this spring as she is flying to Alabama to spend some time with her brother and his family before we leave Lake Mead. We got to drive a couple of our favorite roads, a new road we hadn't been on before and even got in a short hike. Can you tell from this pic she needs some time off ? Joan discovered that Leslie and Chris from RVNomads2too were staying in Boulder City and arranged for us to meet them for lunch. 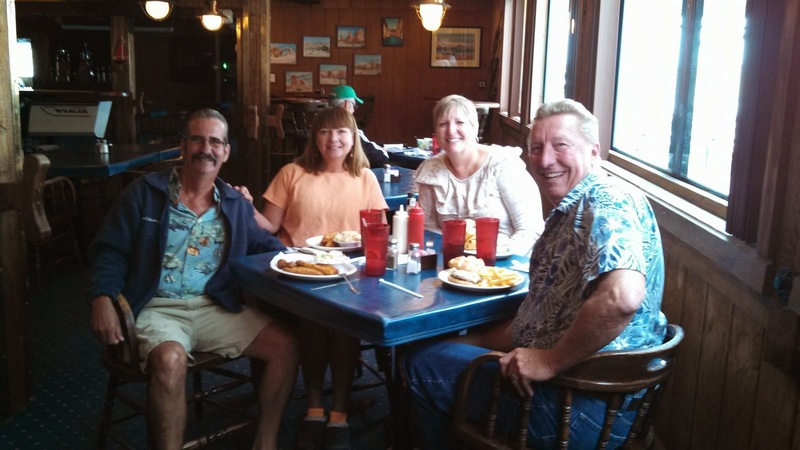 Chris is from Melbourne, FL and Leslie is from Boring, Oregon, the same little community where I played softball when Joan and I were working at Mt Hood. A lot of similarities between us as far as experiences and future plans, so I expect we'll be seeing more of them in the future. This scratch isn't coming out! As for our not-so-fun adventure.....well on the way to Utah I managed to 'kiss' a concrete divider in a construction site on I-15. Just a little gust of wind...and when you're 8' wide in a 10' lane with concrete barriers on both sides...well I suppose you know what happens. A nice 4" wide, 30' long scratch down the side of the MH. No major damage, a new door skin, a new hinge and lots of paint and she'll be good as new. Since our return to Lake Mead after Christmas we had a slow 'leak' in one of the hydraulic jacks that level the MH. No fluid on the ground or on the jacks themselves; just a slow retraction of one jack over a short period of time causing the MH to lean and and move around a little as you walk through. I did a little research on IRV2 ( I love that site) and found several other RVrs that had experienced and resolved that very issue. After checking my MH owners manual I identified the model jacks on my unit, then checked out the manufactures website RVA Jacks. They have detailed schematics of the various model jacks they manufacture as well as troubleshooting guides and operational manuals for all models. In their troubleshooting section they even discussed how to identify what may be causing a leak as well as detailed instructions on how to repair/replace the various parts of their system. 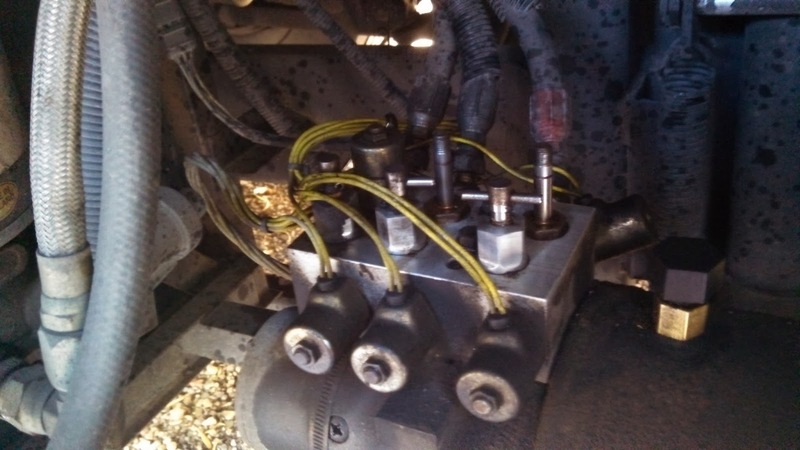 All indications pointed to a problem with one of the 3 retract valves; either a faulty valve or something clogging the valve allowing hydraulic fluid to slowly seep back into the fluid reservoir. I called the manufacturer to order a new valve and spoke with a gentlemen that suggested I switch 2 of the valves with each other to ensure the slow leak followed the valve to the new jack leg. Then when I was sure the retract valve was indeed the problem I could order the new valve. Great Idea! 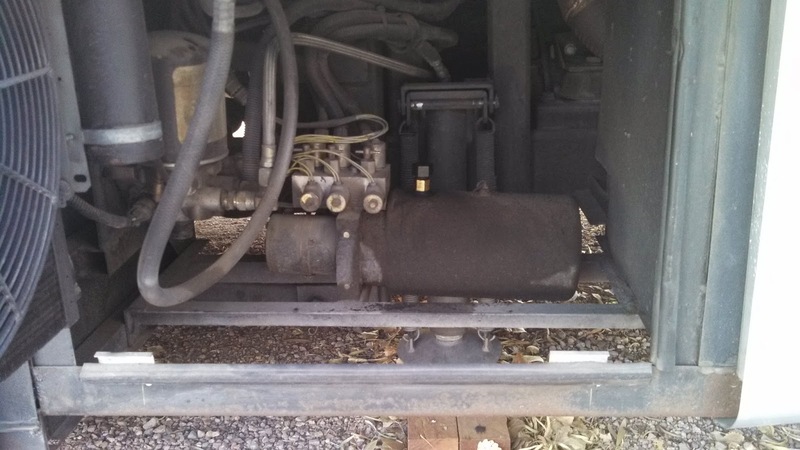 I located the hydraulic reservoir and valve manifold behind the 'dryer' door on the driver side of the MH. 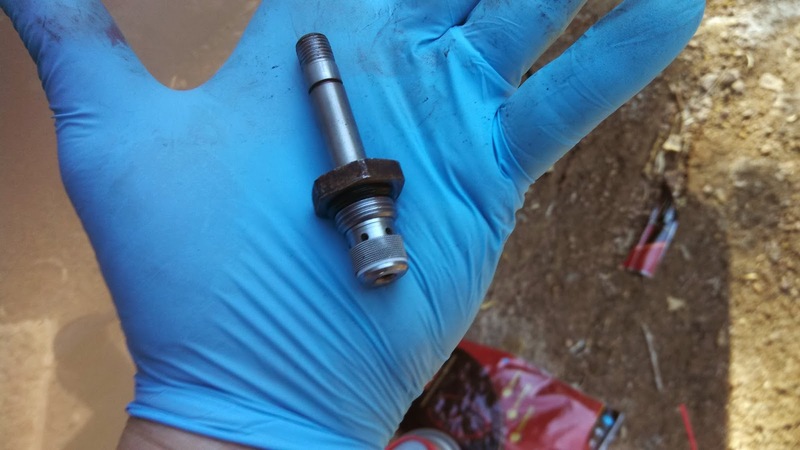 After cleaning the area with a little WD40 I used a 1/2" wrench to remove the coil on top of the valve before using a 7/8" deep socket to remove the suspect retract valve and 1 of the other 2 retract valves. I cleaned both valves before swapping them and reinstalling them back into the manifold. I replaced the covers and coils, torquing them to specs (that was mentioned several times in the troubleshooting guide as well as by the tech at RVA). Then I extended all 3 jacks and re-leveled the MH. That was 6 days ago and guess what..........the MH is still level today. No slow leaks. Looks as though my problem was a bit of trash on the valve O-ring allowing the fluid to flow back into the reservoir. 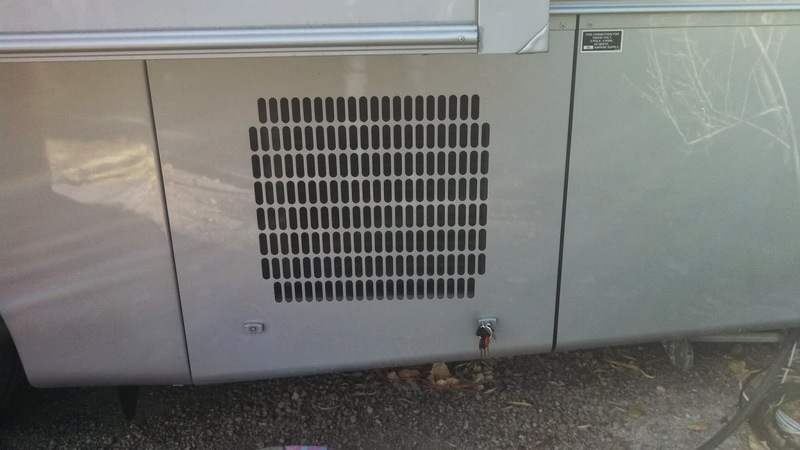 I'm telling you what....if you don't have IRV2 bookmarked on your PC you are missing out on a huge resource for the full and part- time RVer that has an interest in performing some of their own RV maintenance rather than going to the dealership with every issue. And my thanks to RVA Jacks for providing great support of their products. 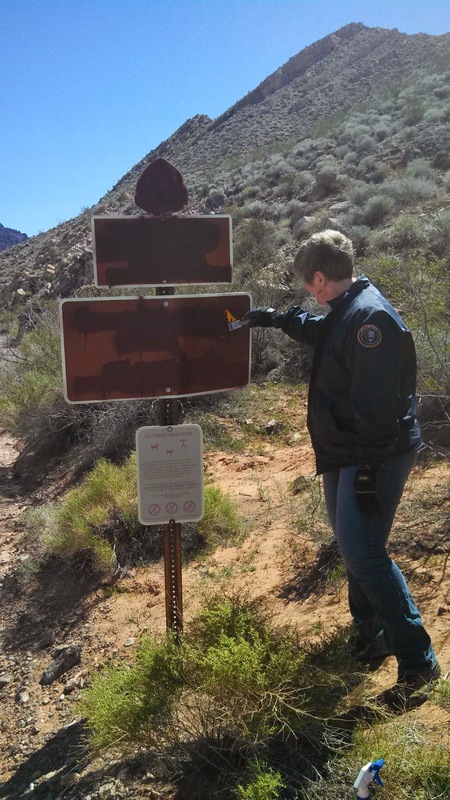 Earlier this week we had a chance to revisit one of our favorite and more adventurous back country roads in Lake Mead; AR70a. This road is located near Kingman Wash just 2 miles into Arizona across Hoover Dam. 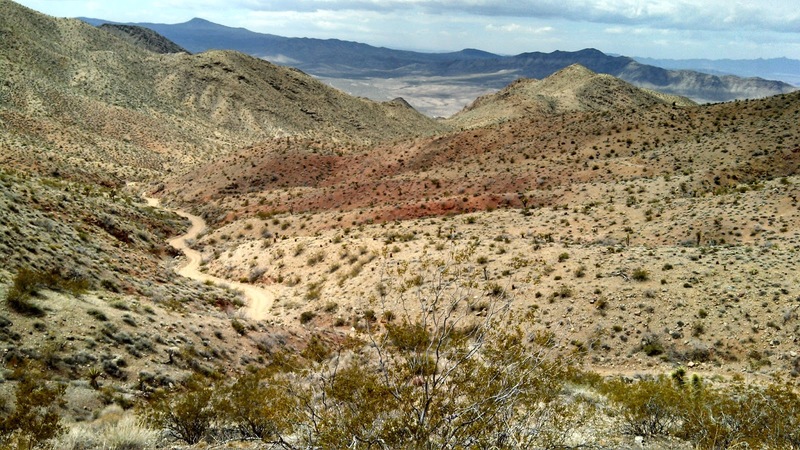 AR70a is a short road that leaves the main road to Kingman Wash and straddles the spine of a mountain ridge while climbing several hundred feet in elevation before intersecting with AR70b which also straddles another mountain spine and returns to the main road. As you drive either AR70 a or b there is almost no room to pull over or turn around because of the steep slope of the mountain on either side of the road. AR70b is rough and 4-wheel drive is recommended. AR70a is even rougher and I would recommend only attempting this one with a high clearance 4x4 vehicle. 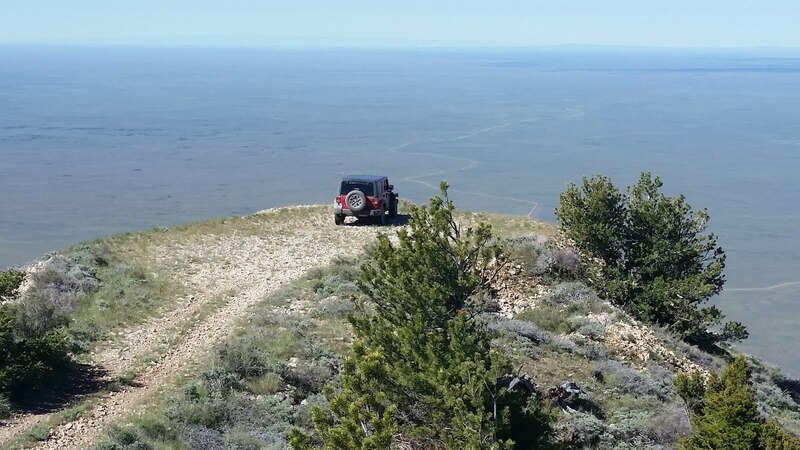 Bring a lunch because the view from the intersection of a & b is truly spectacular. You can see Kingman Wash Cove, Lake Mead, Boulder City, the new bridge at Hoover Dam, Fortification Hill; and on a clear day you can even see parts of Las Vegas. And if you follow the road a little further past the intersection there is an abandoned mining area that is interesting to explore. We added another skill set to our resume; seed distributor. 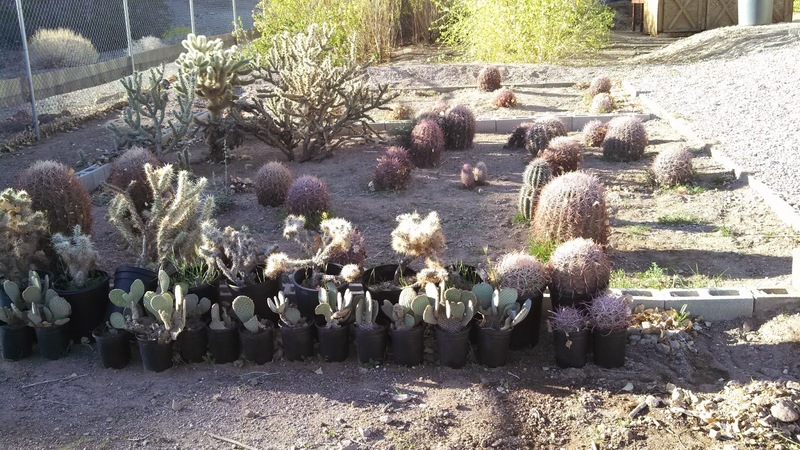 The park service has a plant nursery within the park. 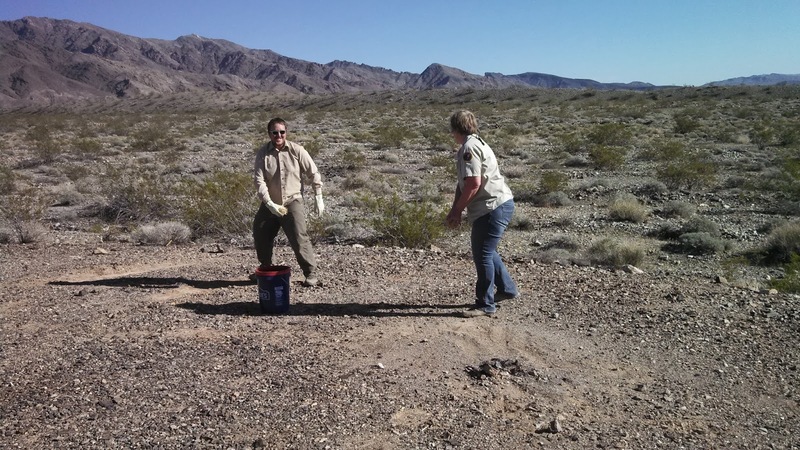 Native species plants are grown here and used to replant areas where desert plants may have been damaged or destroyed. 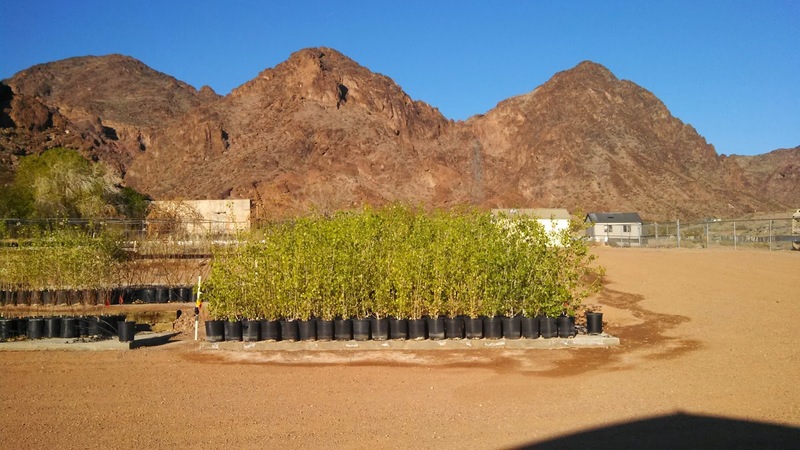 When the decision was made several years ago to build the new bridge across the Colorado River at Hoover Dam the park service combed through the area of the road realignment and harvested as many seeds of the existing plants as possible. 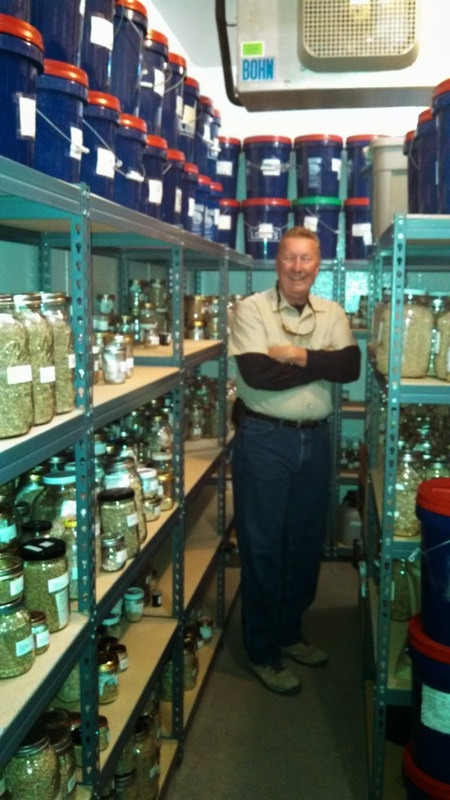 The seeds were sorted and stored at the nursery to be used for future restorations. Our supervisor is also responsible for the nursery and she asked if we'd be interested in scattering the seeds near where they were harvested. Joanie SowsSeeds (kinda' like Johnny Appleseed) didn't hesitate with her answer....."Heck Yeah!" So we loaded up the back of our truck with buckets and buckets (28 to be exact) of seeds and off we went to check out several of the Approved Roads near the dam. And everywhere we stopped throughout the day Joan could be seen throwing caution and seeds to the wind! Luckily, she didn't injure her knee like she did late last year throwing rocks. I guess the seeds were much lighter than the rocks. The next day as we were driving one of the roads located about 10 miles south of town we ran across a disturbance where an ATV had driven off the approved road into a wash, then exited the wash onto an abandoned road bed. 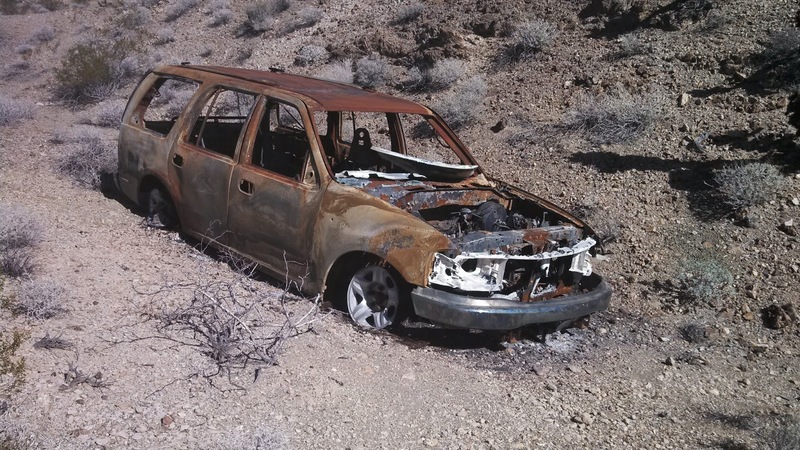 Joan began walking/recording the track on our GPS and after walking several hundred yards she exited back onto the approved road; but not before finding an interesting discovery...an abandoned and burned car. Looked like a fairly recent model SUV, but every bit of plastic and a lot of the engine metals were burnt and melted. We called it into dispatch and we'll have to wait and see if the park service will be able to remove it without causing too much damage to the non-culturally cleared area. year & model it is? The park is huge; incorporating more than 2.5 million acres. And there are areas within the park boundaries that are private property. 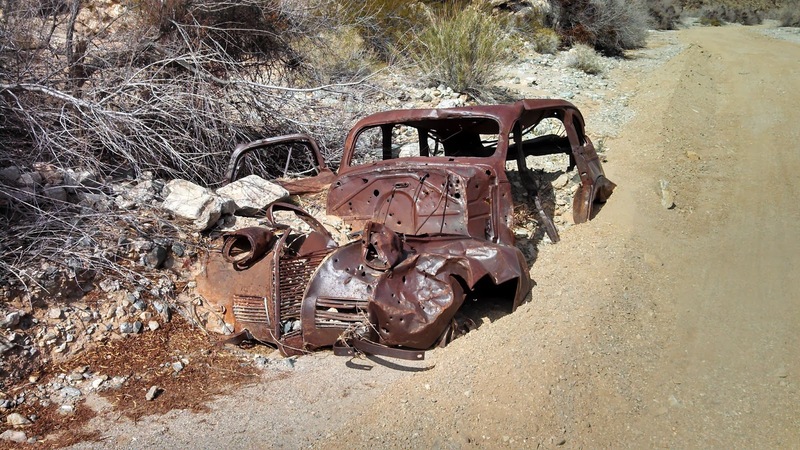 We spotted this car on private property buried in a wash almost 20 miles off the paved road. Guessing at the age of the car, we can only wonder how far was it to a paved road 50 or 60 years ago when it was left here? And what about the fate of the original passengers. Did the car break down and leave them stranded? For how long? Or were they caught up in a flash flood? Adventure whether you want it or not! One of the blogs that we follow is Travel Bug. A few days ago we got a call that the blogs'............ (owners?writers?subjects?what is the correct term?) 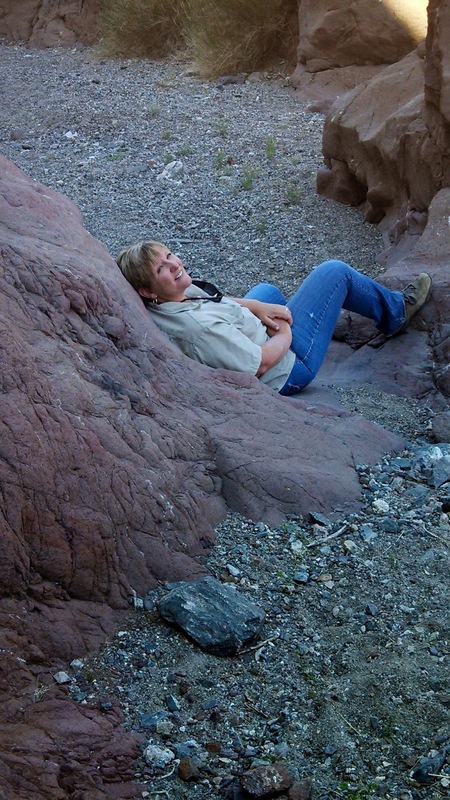 Susan and Bob were going to be stopping over in Lake Mead this week. They checked into Lake Mead RV Park and we drove down to meet them in person. We chatted for a little while sharing RV stories before heading back to our MH with an invitation for them to call us if they had any spare time during their visit. A short while later we got a call that they would like to stop by and learn a few new games. So over they came and we broke out Golf, Liars Dice and Qwirkle. Joan and I had a fun time and we think they did too. 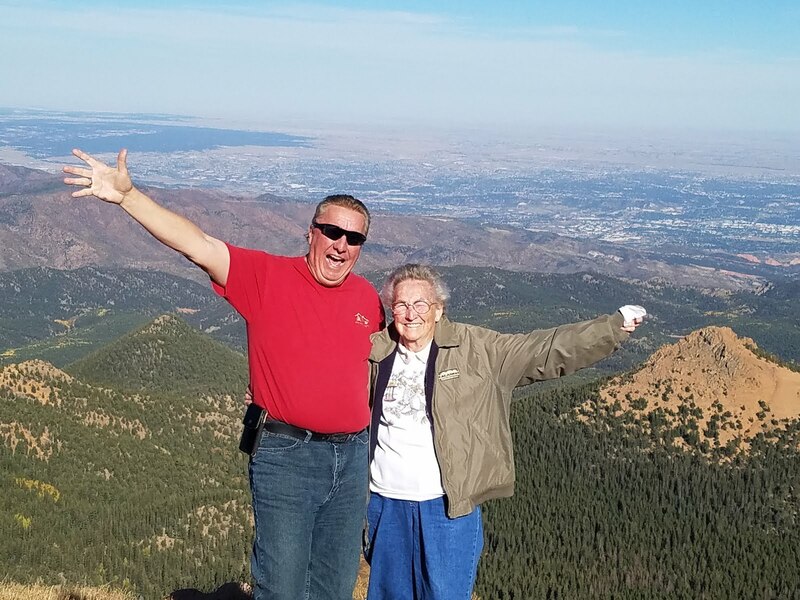 Susan and Bob were great reinforcements of our opinion that the vast majority of the people living this lifestyle are fun to get to know and really enjoy what they do! As I look back over the last year, I think about all of the people we've introduced to the game of Qwirkle. I know we've given about a 1/2 dozen games to friends as Christmas gifts. And we know of at least 3 couples that went out and bought the game after we introduced them to it. I wonder if Joan and I could become Qwirkle Consigliere? Maybe we could make you an offer you couldn't refuse.